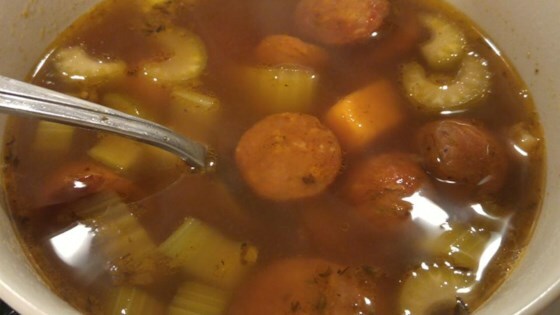 "My husband had a soup similar to this in a restaurant and loved it. Since they would not share the recipe, this is my interpretation." Heat peanut oil in a skillet over medium heat. Season andouille sausage with Cajun seasoning; cook in hot oil until browned, about 5 minutes. Drain excess grease from the skillet. Set sausage aside. Heat vegetable broth in a saucepan over medium heat until warm; add sweet potato and bring to boil. Cook until potato is tender, about 10 minutes. Stir sausage and corn into the broth with the sweet potato. Bring the mixture to a boil and serve immediately. These fresh corn and sausage muffins are perfection any time of day. Very simple to make and very good. -10 degrees this is a perfect soup for this time of the year. I make double batches. Whole family loves it. I do believe in sharing.